The Episode starts with Nikhil asking Kiara to come out silently else it would be bad if he takes her out. Mitali calls her. Nikhil keeps hand on her mouth and takes her from there. Tanu acts crazy and sings song lag ja gale…She thinks shall I go to Mehra house, as when pragya dies, then Abhi will come to me. He needs a shoulder and someone to wipe his tears. She thinks if he is upset with her that she didn’t call him. She then thinks Abhi kicked her out, and says he might be upset with her as she didn’t return. She thinks why didn’t I go back? She thinks if he will forgive me and thinks yes. She says he will forgive me like he forgave Pragya. She says she will tell him that she was upset because of Pragya and that’s’ why didn’t come. She thinks how Pragya got pregnant and thinks the babies might be Abhi’s one night mistake and Pragya must have wooed him. She thinks both Pragya and her babies will go, but she will be with Abhi and Kiara. They will be a happy family. Kiara shouts Mitali Chachi..Mitali hears her name and comes to room. Nikhil hides with Kiara. Mitali thinks Kiara and Sunny are playing and asks them to come out. She thinks why the curtain is moving and gets shocked. She then checks inside, but Nikhil has hidden with Kiara. Mitali calls her and asks her to come out when she counts 3. She asks her to come down fast and says your mamma is missing you. Kiara faints by now. Nikhil thinks what to do, and thinks to kidnap her. He keeps her on bed. He then takes the carpet and wraps her in the carpet. Disha runs behind Sunny and asks him to have juice. He refuses. Mitali thinks she missed the party because of kids. She gets Neha’s call. She sees Nikhil as dhol guy taking the carpet, and asks why is he taking it. He tells that something fell down and that’s why Suwarni Dasi asked him to give it to dry clean. Mitali says she will get it done by Servants. Nikhil says he will do the work. He collides with Tai ji and then manages to come out. He keeps the carpet in the car and thinks he knows that Tanu don’t have the money, but he agreed to do her work. He thinks Abhi ruined him and now he knows what to do with Kiara. Tanu calls Nikhil. Nikhil tells that Kiara saw me. Tanu asks him not to tell that he didn’t do the work. Nikhil says I would have got caught. Tanu says you will not get money. Nikhil says I know you don’t have money. Nikhil says I will take revenge from Abhi and get the money also. Tanu asks what are you going to do? Nikhil asks her to stay out from it and ends the call. He calls Rocky. Pragya tells Abhi that she will go and see Kiara. Tai ji tells Abhi that Sharma ji said that he knows a good doctor. Mitali comes and says Kiara is playing with Sunny. Pragya says she will bring her. Sunny comes with Disha. Mitali says I came upstairs and you both were playing and she was shouting. Abhi goes to see her. Disha asks Pragya not to worry and says Kiara must be playing alone. They ask her not to worry. Pragya says Kiara is not well. Abhi checks her in the rooms, but she is not in the house. He gets worried and asks her to come out. Tanu is in the car and says I hate you Nikhil. She thinks what to do, if shall I handle Kiara or kill Pragya. She thinks I did a mistake by sending Nikhil there, and thinks Abhi, Pragya and her family are not crying, and gets happy thinking they must be crying now also. She thinks the more they cry, the more she will laugh. She wishes Nikhil kills Kiara and then they will go far from each other. She says she will see what to do with Pragya’s twins. She laughs and thinks both Abhi and Pragya will blame each other, have a fight and separate from each other, then she will enter in Abhi’s life and home. She says Tanu returns and laughs. Abhi comes downstairs and says she is not here. He tells that Dadi and Dasi went out, she must be with them. He calls Purab and asks if Kiara is with you. Purab says no. he says I am coming inside. Pragya asks him to call Kiara as she is having her phone, but the call is not picked. Nikhil hires professional kidnappers and calls Rocky. Rocky says I am nervous. Nikhil introduces Rocky to the goons and says they will share the money equally. Rocky tells Nikhil when Abhi calls you, he will not identify your voice. He asks about Kiara. Nikhil tells that she is here and tells that he has kept Kiara’s phone in Mehra Mansion on silent mode. Nikhil calls Pragya and asks her to give call to Abhi if she wants to know about Kiara. He asks Abhi to see in the drawer. Abhi gets shocked to see Kiara’s pic. 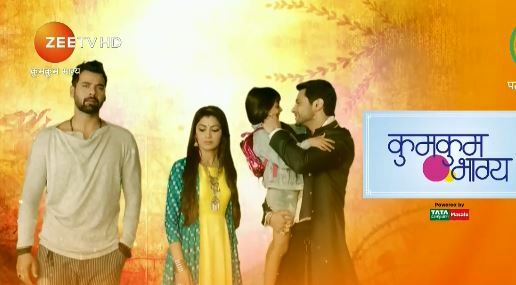 The post Kumkum Bhagya 27th February 2019 Written Episode Update: Nikhil kidnaps Kiara, Tanu rejoices and imagines Abhigya’s separation appeared first on Telly Updates.